Mike has been fascinated by fishes all his life, and has had various fishes as pets since he could barely reach the top of the goldfish bowl. He has been successfully breeding and trading fish with local shops since he was nine years old. Over the past four decades plus he has specialized mainly in miniature fishes, and has had successful spawns from various miniature fishes totaling over 400 species from 32 families of fish. He currently maintains about 3,000 gallons divided into 100 tanks. He is the top ranked breeder of all time in the Missouri Aquarium Society, Inc. (MASI) BAP and the top ranked aquatic horticulturist of all time in MASI’s HAP with over 300 submissions from 50 families, including more than a dozen by seed. He is an American Livebearer Association Century Breeder, with over 100 species of livebearers spawned. He credits his success to large regular water changes, keeping live plants in every tank, and culturing and feeding an assortment of live foods daily for feeding his breeding stock and for growing the fry of these diverse fish. Over the past three plus decades, Mike has given well over 300 talks to classes, clubs, groups, and conventions all over the U.S.A. and Canada, has documented many of his keeping and spawning successes in nearly 300 articles published in hobby publications around the world, and he has had two books on live foods published by TFH Publications. 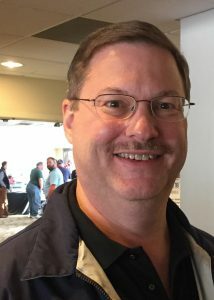 What great fortune we have in Mike and the wonderful knowledge and experience as well as longtime friendship that he brings to CARES and the hobby! Thank you so much Mike for all that you do!